Bixby Creek Bridge, also known as Bixby Canyon Bridge, on the Big Sur coast of California, is one of the most photographed bridges in California due to its aesthetic design, "graceful architecture and magnificent setting". It is a reinforced concrete open-spandrel arch bridge. The bridge is 120 miles (190 km) south of San Francisco and 13 miles (21 km) south of Carmel in Monterey County along State Route 1. 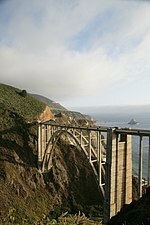 Before the opening of the bridge in 1932, residents of the Big Sur area were virtually cut off during winter due to blockages on the often impassable Old Coast Road, which led 11 miles (18 km) inland. The bridge was built under budget for $199,861 (equivalent to $3.07 million in 2018 dollars) and, at 360 feet (110 m), was the longest concrete arch span on the California State Highway System. It is one of the tallest single-span concrete bridges in the world. The land north and south of the bridge was privately owned until 1988 and 2001. A logging company obtained approval to harvest redwood on the former Bixby Ranch to the north in 1986, and in 2000 a developer obtained approval to subdivide the former Brazil Ranch to the south. Local residents and conservationists fought their plans, and both pieces of land were eventually acquired by local and federal government agencies. After a $20 million seismic retrofit completed in 1996, the bridge remains functionally obsolete. Its 24-foot (7.3 m) width does not meet modern standards requiring bridges to be 32 feet (9.8 m) wide. The bridge is "one of the most photographed features on the West Coast" and in the world. It has been featured on "postcards, TV ads, everywhere," according to Debra Geiler, project manager for the Trust for Public Land. The bridge's location on the scenic Central Coast of California, the parabolic shape of the arch, the tall spandrel columns, and the architectural piers contribute to an "intense aesthetic experience." "It's the gateway to Big Sur and the interior has never been logged. The land is pristine." 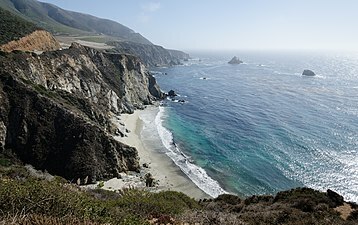 Zad Leavy, former executive director of the Big Sur Land Trust, described the land as "...the most spectacular meeting of ocean and land in the entire United States." 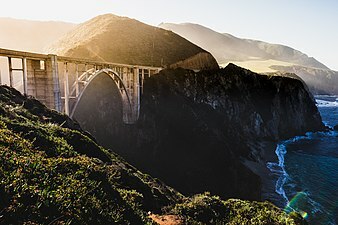 The bridge was already popular before the introduction of smart phones and social media, and visitors to the Bixby Creek Bridge and other Big Sur attractions have dramatically increased since then. The bridge was rated as the No. 1 “Instagram-Worthy Destination for 2019 Travels” by the website Travelpulse.com. There are no toilets within several miles of the bridge, and visitors resort to defecating in nearby bushes. Residents complain about toilet paper, human waste, and trash littering the roadside. During holiday weekends and most summer vacation periods, traffic can come to a standstill as motorists wait for a parking spot. There is a pull out to the north and west side of Highway 1, but when it is full, visitors sometimes fail to completely pull off the highway, leaving inadequate space for passing vehicles. Visitors sometimes park on the east side of the highway on the Old Coast Road, blocking the road and residents' access to their homes. Walking on the roadway near the bridge can be extremely hazardous due to the narrow lanes and steep, high cliffs. The California Highway Patrol has begun restricting parking along certain portions of the highway nearby to prevent accidents. Due to the large number of visitors, congestion and slow traffic between Carmel and the bridge is frequently the norm during popular holiday and vacation periods. The bridge is 714 feet (218 m) in total length and 24 feet (7.3 m) wide, with 260 feet (79 m) of clearance below, and has a main span of 360 feet (110 m), which places 50% of the total roadbed above the arch. The arch ribs are five feet thick at the deck and nine feet thick at the springing line, where they join the towers at their base. The arches are four and one-half feet wide. The bridge was designed to support more than six times its intended load. The two large, vertical buttresses or supporting pillars on either side of the arch, while aesthetically pleasing, are functionally unnecessary. Engineers of later arch bridges such as the Frederick W. Panhorst Bridge omitted them from the design. The Rocky Creek Bridge and the Malpaso Creek Bridge to the north are also open-spandrel arch bridges built of reinforced concrete. The state first began building Route 56, or the Carmel–San Simeon Highway, in 1919. A number of bridges needed to be constructed, the largest among them across Bixby Creek. State engineers considered two alternatives to crossing the creek, an inland route and a smaller bridge, or a coastal location and a larger bridge. The inland route would have needed an 890-foot (270 m) tunnel cut though the Santa Lucia Mountains to a 250-foot (76 m) bridge upstream. The engineers selected the coastal route because it was safer, more scenic, and least affected the environment. California state highway engineer C. H. Purcell and bridge engineer and designer F. W. Panhorst considered whether to build a steel or concrete span. A steel bridge would cost more to build and maintain, as the sea air would require expensive ongoing maintenance and painting. A steel bridge was also less in keeping with the natural environment. Using concrete reduced material costs and allowed more of the total cost to be paid to workers, which was a positive aspect of the design during the Depression. They chose concrete in part because it would not only reduce both construction and maintenance costs but would also echo the color and composition of the natural rock cliff formations in the area. The state awarded a contract for $203,334 to the lower bidder, Ward Engineering Company of San Francisco, on August 13, 1931. Construction began on August 24, 1931. Over 300,000 board feet (700 m3) of Douglas fir timber, used to build a 250-foot (76 m) high falsework to support the arch during construction, was transported from the railroad terminal in Monterey over the narrow, one-way road to the bridge site. The falsework, built by crews led by E. C. Panton, the general superintendent, and I. O. Jahlstrom, resident engineer of Ward Engineering Co., was difficult to raise, because it was constantly exposed to high winds. Some of the falsework timbers were 10 by 10 inches (250 mm × 250 mm). It took two months to construct the falsework alone. When high waves threatened the falsework foundation, construction was halted for a short time until winter storms abated. The crews excavated 4,700 cubic yards (3,600 m3) of earth and rock. Eight hundred twenty-five trucks brought in 600,000 pounds of reinforcing steel. Sand and gravel were supplied from a plant in Big Sur. Construction required 45,000 sacks or 6,600 cubic yards (5,000 m3) of cement which was transported from Davenport, near Santa Cruz, and from San Andreas. Crews began placing concrete on November 27. The concrete was transported across the canyon on platforms using slings suspended from a cable 300 feet (91 m) above the creek. The bridge was completed on October 15, 1932, although the highway was not finished for another five years. At its completion, the bridge cost $199,861 and, at 360 feet (110 m), was the longest concrete arch span on the California State Highway System. The bridge was necessary to complete the two-lane road which opened in 1937 after 18 years of construction. The completion of construction was celebrated with a ribbon-cutting ceremony led by Dr. John L.D. Roberts, who had conceived of the need for the road. After the bridge was completed, it was at times known as the Rainbow Bridge, due to the presence of the Rainbow Lodge resort on the creek upstream from the bridge. It was operated by former Army Captain Howard Sharpe and his wife, Frida. After timber harvesting was no longer profitable, Sharpe bought the Bixby Creek Canyon ranch in 1919. He built a dirt road from the lodge up the canyon to Bixby Landing and another road down to the beach at the mouth of Bixby Creek. He sold part of his land to the state as part of the bridge right-of-way in 1930. When the bridge was completed and tourists no longer needed to descend to his lodge on the creek, he built a new lodge on the highway north of the bridge. The bridge was retrofitted beginning in 1996 with an analysis by bridge engineering company Buckland & Taylor as part of the Caltrans Phase II seismic retrofit program. In their detailed evaluation of the bridge's seismic vulnerabilities, they were challenged to find a solution that met several difficult issues, including severe load factors, extremely limited physical access, maintaining the appearance of the existing historical structure, and a requirement by the State of California that at least one lane of the bridge remain open at all times. The crux of the design was the longitudinal post-tensioning of the entire bridge deck from end to end. The $20 million seismic retrofit began in May 1998. The cost of the retrofit was considerably increased by the requirement to preserve the historical look of the bridge. Prime contractor Vahani Construction of San Francisco was assisted by Faye Bernstein & Associates and Waldron Engineering. To reinforce the abutments supporting the bridge deck at either end, engineers put in place a floating slab, continuous with the deck, keyed into a massive pile cap with six 72-inch (1,800 mm) diameter cast-in-drilled-hole (CIDH) piles behind each abutment. To support the towers, engineers designed a full height structural wall that was integrated within each of the two existing towers. During the retrofit, they removed the top portion of the towers, including the roadway, and replaced them with a prestressed diaphragm that anchors the full height of the vertical tower. The diaphragm simultaneously distributes the vertical prestressing forces uniformly to the new concrete structural wall and the existing tower's concrete. The deck, which curves from one end to the other, was reinforced by adding heavily confined edge beams encasing high strength steel along the inside face of the exterior longitudinal girders underneath. These rods extended from one end of the roadway to the other. The reinforced edge beams ensure continuity across the many expansion joints and help distribute the bending strains due to lateral flexure. In addition to the reinforced edge beam, four large prestressing tendons were installed the length of the bridge along the underside of the deck slab. These tendons are stressed to pre-compress the concrete deck to approximately 800 psi and also serve as flexural reinforcement along with the high strength rods. Finally, engineers found a way to reinforce the bent columns attached to the arch, which possess complex and varying geometric challenges. They encased the bent columns with thin, lightweight, composite carbon fiber jackets that provide the necessary degree of confinement to ensure ductile response and also mimic the original design. In addition to the analyses performed by Buckland and Taylor, Caltrans commissioned Lawrence Livermore National Laboratory to perform an independent study of the structure both with and without the proposed retrofit measures in place. The final report, which was published in June 1999, concludes that the retrofit appears to be appropriate even for earthquake ground motions including near-field displacement pulses, which were not considered in the original analyses. As a result of the retrofit, the continuous, stiffened deck has four lateral reaction points: two new massive abutments anchored by large-diameter, cast-in-drilled-hole piles. The two towers are strengthened and anchored to rock with tie-down anchors within the towers. The arch ribs are laterally supported at their crowns by new shear keys that link them to the reinforced deck. The expensive retrofit, completed in November 2000, still left the bridge officially classified as "functionally obsolete" because at 24 feet (7.3 m) in width, the bridge is less than the 32 feet (9.8 m) standard required of newly built bridges. The bridge contributes to the scenic attraction of driving Highway 1. The 72 miles (116 km) section of the highway from Cambria to Carmel Highlands was the first in the state to be designated as a Scenic Highway in 1965. In 1966 First Lady Lady Bird Johnson led the official scenic road designation ceremony at Bixby Creek Bridge. The land was historically occupied by the native Esselen people who visited the coast seasonally to harvest shellfish along the coast and fish offshore. When the Spanish established the California mission system, only a very few were not baptized and conscripted, and they soon left the mountains to work on the nearby ranches. :114 Governor Juan Alvarado granted the land from present day Carmel south to Palo Colorado Canyon, two miles north of Bixby Creek, to Marcelino Escobar in 1839 as part of the Rancho San Jose y Sur Chiquito. The land was later acquired by Alvarado's brother-in-law José Castro. Castro built a trail from Monterey to Palo Colorado Canyon as early as 1853, when he filed a map of his purchase. Bixby Creek is named after pioneering Yankee businessman Charles Henry Bixby. Originally from Livingston County, New York, he arrived in California in 1852 and remained for five years. He returned east before coming back to California. After some success raising cattle in Sonoma County, he obtained a patent on April 10, 1889 for 160 acres (65 ha) south of Bixby Creek, and later bought additional tracts of land on the north side of the creek, between it and Palo Colorado Canyon. He built a sawmill with a capacity of twelve thousand feet of lumber per day on the creek, which for many years was known as Mill Creek. He harvested timber and turned it into shakes, shingles, railroad ties, and trench posts. He also harvested the bark of the tanbark oak, which was used for tanning cow hides. he built a landing chute and hoist to transfer the lumber to ships anchored slightly offshore. Schooners were moored to deadeyes embedded in rocks of the adjacent shore. Cargo was hoisted in slings from the landing along a cable winched onto the waiting ship. Bixby discovered lime deposits on Long Ridge above Mill Creek. He had kilns built and used mules to haul the lime to the coast on wooden sleds. It was impossible to build a wharf from the cliffs that dropped into the ocean, and he instead built a hoist that could be used to ferry goods to and from ships anchored slightly offshore. The powdered lime was packed into barrels that were then attached to cable strung from the coastal cliff and about 50 yards out into the Pacific Ocean, where it was loaded aboard coastal schooners. He sold the fired lime for use in cement, mortar, and other building materials. Bixby tried to persuade the county to build a road to Bixby Creek, but they refused, replying that "no one would want to live there." In 1870, Bixby and his father hired men to improve the track and constructed the first wagon road including 23 bridges from the Carmel Mission to Bixby Creek. In 1906, after he exhausted the supply of commercial timber, Bixby sold the land to the Monterey Lime Company. Lime was in great demand to help re-build San Francisco following the 1906 earthquake. The company built lime kilns 3 miles (4.8 km) up Bixby Canyon from the coast and mined the high grade limestone located in the area. To feed the limekiln fires, they cut much of the old growth redwood in the canyon. They built a 3 miles (4.8 km) aerial tram to haul the barrels of limestone from Long Ridge to Bixby Landing. A small group of homes grew up around the original Bixby Homestead. The kilns operated for four years until 1911 when a log jam during winter rains caused a flood in the canyon. closed the kilns in 1910. The tram was used for a while longer to off and on-load supplies for the community from schooners. In 1986 a portion of the land formerly owned by Bixby was held by Humboldt County-based Philo Lumber Company. They obtained a state permit to log over a million board feet of redwood. The residents of Palo Colorado Canyon were intensely opposed to the plan, but it was only derailed by the savings and loan crisis. The property was seized by federal financial regulators and was later sold to the Big Sur Land Trust, which then sold it to the Monterey Peninsula Regional Park District in 1988. The district joined it with three adjacent properties to form the Mill Creek Redwood Preserve. In the 20th century, Axel Adler built a cabin on the former Bixby Ranch and gradually acquired more land. In 2013, a 1,199 acres (485 ha) portion of the 1,312 acres (531 ha) Adler Ranch was put on the market for $15 million. It is located at the end and south of Palo Colorado Road. It is adjacent to Los Padres National Forest, Mill Creek Redwoods Preserve, and includes the peak of Bixby Mountain and the upper portions of Mescal Ridge. The El Sur Ranch and Pico Blanco Mountain are to the south. The property is especially valuable because it includes nine legal parcels, five of which can be built on. The Big Sur Land Trust stated it is not interested in acquiring the property. The nonprofit Western Rivers Conservancy, which buys land with the goal to protect habitat and provide public access, secured a purchase agreement. It is interested in selling the land to the US Forest Service, which would make it possible for hikers to travel from Bottcher’s Gap to the sea. But some local residents are opposed to the forest service acquiring the land. They are concerned about a lack of federal funding to maintain a critical fire break on the land. Bixby Landing in 1911—known then as Hamilton's Landing on Mill Creek—was used to transport supplies and products to and from ships off shore. A post office was built near the sawmill in the early 1880s and was then moved west to the mouth of the canyon. Thomas Fussell bought the land and then sold it to Horace Hogues. In 1919, Captain Howard G. and Frida Sharpe bought the Bixby Creek canyon property. Remnants of its prior use included an old ranch house, barn, corral, dance hall, stable, numerous out-buildings, and several cabins that they rented to visitors. Sharpe built a dirt road from the lodge up the canyon to Bixby Landing and another road down to the beach at the mouth of Bixby Creek. When the bridge was completed, the lodge on Bixby Creek was no longer on the route used by tourists. In 1931 Sharpe built a new stone Rainbow Lodge on the western shoulder of the highway immediately north of the bridge. The former lodge in the canyon bottom was abandoned. In 1938, Sharpe re-discovered a colony of California sea otters, thought to be extinct. More tourists came to see the sea otters and Sharpe added cabins and renamed it the Bixby Inn. The restaurant was closed at the beginning of World War II when gas conservation restricted travel and later sold to Gallatin Powers, who renamed it Gallatins, and later the Crocodile's Tail. Years later, the site became geologically unsafe and the building was bulldozed over the cliff. A fire in 1941 burned what was left of the ranch on the canyon floor, and the Sharpes subdivided the property and sold parcels. The former Brazil Ranch (also known as the Bixby Ocean Branch) is located on Serra Hill immediately south of Bixby Creek and the Bixby Creek Bridge, making it one of the most photographed spots on the Big Sur coast. Job Heath obtained a land patent on May 20, 1884 and he and his wife Serena Waters homesteaded the ranch. Antonio Brazil married Mary Pfeiffer and they bought Heath's property. The hill is not named for Junipero Serra, but is a corruption of the Spanish word, cerro, meaning "high hill." The Brazil family operated the 1,255 acres (508 ha) ranch for nearly a century. In 1977, Tony and Margaret Brazil sold the ranch to Allen Funt, creator of the television show Candid Camera. Funt raised quarter horses and cattle on it. He built a cabin and barn on the site and improved it for use as a ranch. After Funt had a stroke in 1993, he tried to interest environmental groups in buying the land without success. After Funt died in 1999, land speculator Ben Sweeney and two partners, acting as Woodside Partners, a Las Vegas-based company, began nine months of negotiations to buy the property. Sweeney's lawyer unearthed long-forgotten records showing that the property was originally composed of nine land patents. He and his partners persuaded county officials to keep mum and bought the land for $9.2 million. As permitted by law, he obtained county permission to subdivide the land into nine parcels, vastly increasing its value. He soon sold Funt's house and the parcel it stood on for $7.2 million. Sweeney's actions stunned local community leaders and activists, who joined together to prevent him and his partners from subdividing and developing the land. Less than a year later, the Trust for Public Land bought the property for more than $26.25 million, almost tripling what the partners paid. On September 24, 2002, they and the U.S. Forest Service announced that the land had been added to the Los Padres National Forest. While criticized by some for the huge profit they took in selling the property to the trust, a local real estate agent said if Sweeney and his partners had sold the land to private parties, they could have earned as much as $50 million. The public can enter the USFS land using an unmarked gate to a little-used dirt road on the east side of Highway 1, 0.1 miles (0.16 km) south of the Bixby Creek Bridge. There is no parking lot. Visitors can hike up a steep trail to the ridge overlooking the coast. To access the Mill Creek Redwood Preserve, a 2.7 miles (4.3 km) trail was built by hand over ten years from Palo Colorado Road to an overlook. To limit traffic on narrow Palo Colorado Road, access is limited to day use and only six permits per day are available. Visitors must obtain a permit in advance from the Monterey Peninsula Regional Park District to visit the preserve. The trail head is located 6 miles (9.7 km) inland on Palo Colorado Road. The Old Coast Road that the bridge replaced remains open to vehicles, weather permitting. The Old Coast Road from the north side of Bixby Creek is 11 miles (18 km) long, cutting inland across the Little Sur River, and ends near the northern border of Andrew Molera State Park, 8.3 miles (13.4 km) to the south along Highway 1. The bridge was commemorated in an express mail stamp issued on February 3, 2010. The United States Postal Service introduced an $18.30 definitive stamp designed by Carl T. Herrman of North Las Vegas, Nevada. The stamp features a color digital illustration of Bixby Creek Bridge by Dan Cosgrove of Clarendon Hills, Illinois. The bridge was featured in the opening scene of the 1969-70 television series Then Came Bronson, in the films Play Misty for Me and The Sandpiper, and in numerous auto commercials. The bridge is also featured in the video game Grand Theft Auto V. Most recently, the bridge was featured in the opening credits of the 2017 miniseries Big Little Lies. On January 20, 2016, two BASE jumpers died when they landed near the surf and drowned. Officials only determined that the two were missing on January 23 after their rental car was found abandoned near the bridge. Searchers found only the man's parachute, helmet, and video camera. Video recovered from the helmet camera revealed how they died. Mary Catherine Connell landed safely on the small beach but was overwhelmed in succession by three waves. BASE jumping instructor Rami Kajala saw her overtaken by the waves and unsuccessfully attempted to rescue her. Kajala's body was found more than two weeks later. Connell's body was never recovered. ^ a b c d e Rutherford, M. A. 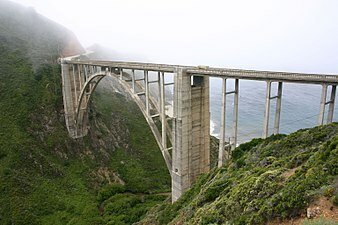 "A Critical Analysis of Bixby Creek Bridge" (PDF). Proceedings of Bridge Engineering 2 Conference 2009 April 2009, University of Bath, Bath, UK. Archived (PDF) from the original on March 4, 2016. Retrieved December 10, 2012. ^ a b Spradling, David (April 21, 2015). "Young Bixby Wagons West". Archived from the original on September 14, 2016. Retrieved September 5, 2016. ^ Craven, Jackie. "Bixby Bridge in Big Sur, California". Archived from the original on January 16, 2013. Retrieved December 9, 2012. 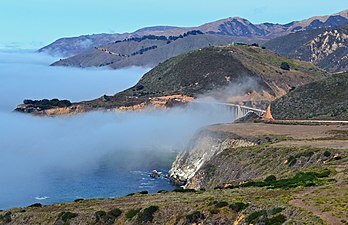 ^ "Bixby Creek Bridge on Highway One". www.caviews.com. Retrieved December 6, 2017. ^ "Arch Bridges: Bixby Creek Bridge". www.bridgeofweek.com. Retrieved December 6, 2017. ^ "Big Fun in Big Sur". www.oaklandmagazine.com. Retrieved December 6, 2017. ^ McCabe, Michael. "Land Trust Saves Big Sur Ranch / Developer pockets $24 million after one-year ownership". SFGate. San Francisco Chronicle. Archived from the original on November 18, 2016. Retrieved November 17, 2016. ^ Studio, Scott Saunder, Design 7. "Cambria Historical Society - Local History: The Building of Highway One". www.cambriahistoricalsociety.com. Retrieved December 6, 2017. ^ "Closures, Thoughtless Visitors Try Big Sur Locals' Patience". Link TV. June 22, 2017. Retrieved January 10, 2018. ^ "Guidelines for Corridor Aesthetic" (PDF). Highway 1 Big Sur Coast Highway Management Plan. California Department of Transportation. Retrieved January 11, 2018. ^ "Road trip on the Pacific Coast Highway - LosApos". www.losapos.com. Archived from the original on September 23, 2016. ^ "Congested Areas". Big Sur Visitor Guide. Archived from the original on January 6, 2018. Retrieved January 6, 2018. ^ "Our response to California State Parks Preferred Alternative". Big Sur Land Trust. Archived from the original on November 7, 2017. Retrieved January 6, 2018. ^ "Concrete Arch Bridges California Canyon". Popular Mechanics. Hearst Magazines. April 1933. ^ a b c d Vitousek, Sean. "Big Sur Bixby Bridge". Archived from the original on November 19, 2011. Retrieved November 13, 2011. ^ a b c d e f Newland, Renee. "Bixby Creek Bridge". Monterey County Historical Society. Archived from the original on July 16, 2004. Retrieved November 13, 2011. ^ a b c d "Bixby Creek Bridge, Big Sur Coast on Highway One, Calif". California Views Historical Photo Collection. December 1, 2012. Archived from the original on June 14, 2012. Retrieved December 9, 2012. ^ a b c Longfellow, Rickie (April 7, 2011). "Back in Time". Back in Time. U.S. Department of Transportation, Federal Highway Administration. Archived from the original on January 29, 2012. Retrieved December 16, 2011. ^ "Hwy One - Big Sur Road - History and Issues". www.pelicannetwork.net. Archived from the original on October 18, 2017. Retrieved December 15, 2017. ^ "Bixby Bridge". cambriahistory.org. CAMBRIA HISTORY EXCHANGE. Retrieved December 15, 2017. ^ "Bixby Creek Bridge Near Carmel, California, U.S.A." Buckland & Taylor Ltd. Archived from the original on September 28, 2016. Retrieved December 16, 2011. ^ a b Pollock, P.E., Brad. "Safeguarding Bixby Bridge". Archived from the original on April 2, 2015. Retrieved December 10, 2012. ^ a b c Wilson, J. G. "Innovative Techniques for the Seismic Retrofit of Bixby Creek Concrete Arch Bridge" (PDF). P. E. L. Panian. Retrieved December 9, 2012. ^ McCallen, David; Noble, Charles; Hoehler, Matthew (1999). The seismic response of concrete arch bridges – With focus on the Bixby Creek Bridge. Carmel, California (PDF) (Technical report). Lawrence Livermore National Laboratory. UCRL-ID-134419. Archived (PDF) from the original on December 24, 2015. ^ "Bixby Creek Bridge". Buckland & Taylor. Archived from the original on January 5, 2016. Retrieved December 10, 2012. ^ Cadd, Brian Shultis, Dennis. "Route 1 - Scenic Highway". www.dot.ca.gov. Retrieved December 6, 2017. ^ "California Highways: State Highway Types". www.cahighways.org. Retrieved December 6, 2017. ^ Pavlik, Robert C. (November 1996). "Historical Overview of the Carmel to San Simeon Highway" (PDF). Historic Resource Evaluation Report on the Rock Retaining Walls, Parapets, Culvert Headwalls and Drinking Fountains along the Carmel to San Simeon Highway. California Department of Transportation. Archived (PDF) from the original on July 11, 2012. Retrieved December 17, 2011. ^ Pritzker, Barry M. (2000). A Native American Encyclopedia: History, Culture, and Peoples. Oxford: Oxford Univ. Press. ISBN 978-0-19-513877-1. ^ "Diseño map of Rancho San Jose Y Sur Chiquito" (GLO No. 552 ed.). Monterey County, California. Archived from the original on October 12, 2016. Retrieved August 14, 2016. ^ a b c JRP Historical Consulting Services (November 2001). "Big Sur Highway Management Plan" (PDF). Corridor Intrinsic Qualities Inventory Historic Qualities Summary Report. CalTrans. p. 38. Archived (PDF) from the original on September 5, 2008. Retrieved November 14, 2009. ^ "Charles H Bixby, Patent #CACAAA-090682". The Land Patents. Retrieved August 20, 2016. ^ "Loading Chute Bixby Landing Aka Hamilton's Landing At Mill Creek 1885 by California Views Archives Mr Pat Hathaway Archives". Pixels. Retrieved March 23, 2019. ^ McGlynn, Betty Hoag (September 1, 1988). "Partington Landing: of Poets, Artists, and Ships in the Big Sur Country" (PDF). Noticias del Puerto de Monterey. The Monterey History and Art Association. 24 (3). Retrieved March 23, 2019. ^ a b c Anderson, Corby. "Mill Creek Redwood Preserve Trail taps the serenity of Palo Colorado Canyon". Monterey County Weekly. Retrieved August 12, 2016. ^ a b Walton, John (2007). "The Land of Big Sur Conservation on the California Coast" (PDF). California History. 85 (1). Archived from the original (PDF) on August 22, 2015. Retrieved August 14, 2016. ^ a b c "Mill Creek Redwood Preserve". Monterey Peninsula Regional Park District. Archived from the original on September 19, 2016. Retrieved September 5, 2016. This article incorporates text from this source, which is in the public domain. ^ a b c Williams, Honey. "Redwood Sanctuary" (PDF). Retrieved December 18, 2017. ^ a b Counts, Chris (March 26, 2010). "Big Sur mountain is on the market: $15M". www.pineconearchive.com. ^ a b Schmalz, David. "A proposition to create more public land in Big Sur has some residents seeing red". Monterey County Weekly. Retrieved March 19, 2018. ^ "History". Big Sur Coast Properties - Big Sur Real Estate. Retrieved December 15, 2017. ^ "Job W Heath Sr, Patent #CACAAA-090653". Land Patents. Retrieved August 20, 2016. ^ Norman, Jeff (2004). Big Sur. Charleston, S.C.: Arcadia Pub. p. 50. ISBN 978-0-7385-2913-4. ^ Clark, Donald Thomas (1991). Monterey County Place Names: A Geographical Dictionary. Carmel Valley, Calif.: Kestrel Press. ISBN 9781880478011. OCLC 24504537. ^ a b McCabe, Michael (March 25, 2001). "Land Trust Saves Big Sur Ranch / Developer pockets $24 million after one-year ownership". SFGate. San Francisco Chronicle. Retrieved February 28, 2018. ^ Starr, Kevin (2006). Coast of Dreams: California on the Edge, 1990-2003. New York: Vintage Books. p. 643. ISBN 978-0-679-74072-8. ^ "Big Sur Coastland Protected". Trust for Public Land. September 24, 2002. Archived from the original on September 21, 2016. Retrieved August 21, 2016. ^ Bailey, Eric (February 22, 2001). "Trust to Buy Key Big Sur Property". Los Angeles Times. Retrieved May 14, 2018. ^ "Brazil Ranch" (PDF). Archived (PDF) from the original on October 11, 2016. Retrieved August 12, 2016. 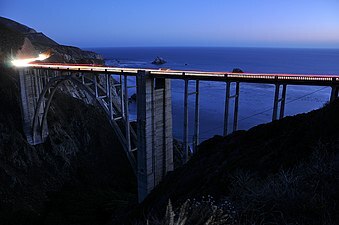 ^ "Bixby Creek Bridge $18.30". US Postal Service. Archived from the original on February 5, 2013. Retrieved December 10, 2012. ^ Hathaway, Pat. "Bixby Creek Bridge on Highway One photo". caviews.com. Retrieved December 15, 2017. ^ "Bixby Creek Bridge". Bridgehunter.com. Retrieved December 15, 2017. ^ a b "Bixby Canyon Bridge". Roadtrippers. Retrieved December 15, 2017. ^ "Movie Atlas: Driving the California Coast". Modern Vacation Home Rentals. Retrieved December 15, 2017. ^ "If You're Wondering Where 'Big Little Lies' Was Filmed, Plan A Trip To Monterey". huffingtonpost.com. Retrieved May 6, 2018. ^ "Two Base jumpers presumed dead after parachuting off bridge". Metro. January 27, 2016. Retrieved December 5, 2017. ^ Wright, Tommy. "California BASE jumpers thought drowned below Big Sur's Bixby Bridge – The Mercury News". Monterey Herald. Archived from the original on March 23, 2017. Retrieved March 22, 2017. ^ Wright, Tommy. "Officials ID body found near Big Sur bridge as BASE jumper – The Mercury News". Monterey Herald. Archived from the original on March 23, 2017. Retrieved March 22, 2017. ^ Lyons, Jenna (February 4, 2016). "Body of BASE jumper in Big Sur double tragedy IDd". SFGate. Archived from the original on May 25, 2017. Retrieved March 22, 2017. This article contains content from government publications that are in the public domain. The year 1932 in architecture involved some significant events. Charles Henry Purcell (27 January 1883 – 7 September 1951) was the chief engineer during the construction of the San Francisco–Oakland Bay Bridge, and one of the most distinguished civil engineers in the United States during the 20th century. The American Society of Civil Engineers selected the Bay Bridge as one of the seven modern civil engineering wonders of the United States in 1955. As California Director of Public Works, he oversaw construction of the first freeway in the American West. He also oversaw design of the first stack interchange in the world, the Four Level Interchange just north of downtown Los Angeles. He played an instrumental role on the National Interregional Highway Committee which persuaded Congress to authorize the Interstate Highway System. He worked primarily in the public sector on the United States west coast throughout his life. 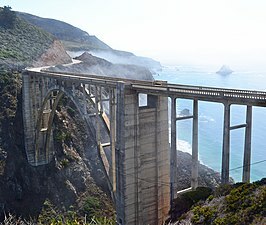 The Frederick W. Panhorst Bridge, more commonly known as the Russian Gulch Bridge, is a reinforced concrete open-spandrel deck arch bridge on California State Highway 1, spanning Russian Gulch Creek in Russian Gulch State Park, Mendocino County, California, United States. It is named after Frederick W. Panhorst, who served as the Chief of the Bridge Section of the California Division of Highways from 1931 to 1960. Malpaso Creek is a small, coastal stream 5 miles (8.0 km) south of Carmel in Monterey County, California, United States. It is generally regarded as the northern border of Big Sur in central coastal California. Nancy Jean Cartwright (born October 25, 1957) is an American actress, voice actress, comedian, writer, producer and director, known for her long-running role as Bart Simpson on the animated television series The Simpsons. Cartwright also voices other characters for the show, including Nelson Muntz, Ralph Wiggum, Todd Flanders, Kearney and Database. Cartwright was born in Dayton, Ohio. Cartwright moved to Hollywood in 1978 and trained alongside voice actor Daws Butler. Her first professional role was voicing Gloria in the animated series Richie Rich, which she followed with a starring role in the television movie Marian Rose White (1982) and her first feature film, Twilight Zone: The Movie (1983). Besides The Simpsons, Cartwright has also voiced numerous other animated characters, including Daffney Gillfin in The Snorks, Rufus in Kim Possible, Mindy in Animaniacs, Pistol in Goof Troop, Margo Sherman in The Critic, Todd Daring in The Replacements, and Charles "Chuckie" Finster, Jr. in Rugrats and All Grown Up! (a role she assumed in 2002, following the retirement of Christine Cavanaugh). In 2000, she published her autobiography, My Life as a 10-Year-Old Boy, and four years later, adapted it into a one-woman play. In 2017, she wrote and produced the film In Search of Fellini. Narrow Stairs is the sixth studio album by indie rock band Death Cab for Cutie, released on May 12, 2008 in the United Kingdom and on May 13, 2008, in the United States, on Atlantic and Barsuk Records.Four singles were released for the album: "I Will Possess Your Heart", "Cath...", "No Sunlight", and "Grapevine Fires". "I Will Possess Your Heart" reached number six on the U.S. Alternative Songs chart, was named iTunes UK song of the year 2008, and was nominated for the 2009 Grammy Award for Best Rock Song. "Cath..." and "Grapevine Fires", also reached number ten and number twenty-one on the U.S. Alternative Songs chart, respectively. Narrow Stairs reached number one on the Billboard 200, making it Death Cab for Cutie's highest charting album to-date. A parabolic arch is an arch shaped like a parabola. Such arches are used in bridges, cathedrals, and elsewhere in architecture and engineering. Rocky Creek Bridge is a reinforced concrete open-spandrel arch bridge in California, built in 1932. It is located in Monterey County, on the Cabrillo Highway ( SR 1) about 12 miles (19 km) south of the village of Carmel-by-the-Sea (or "Carmel" for short), and about a mile north of the more famous Bixby Creek Bridge. As its name implies, it spans the Rocky Creek. A turnout with limited parking space exists to the northwest of the bridge, for tourist use. The vicinity ecology is noteworthy in that the marine waters at the mouth of Rocky Creek are a habitat for the endangered southern sea otter, E. l. nereis. Additionally, on a ridge above Rocky Creek is one of the few known habitats of Yadon's piperia, a North American rare and endangered species of orchid. Samuel Sharon Farr (born July 4, 1941) is an American politician who was the U.S. Representative for California's 17th (1993–2013) and 20th congressional districts (2013–17). He is a member of the Democratic Party. He was elected to Congress in a 1993 special election when longtime Democratic Rep. Leon Panetta resigned to become Director of the Office of Management and Budget. On November 12, 2015, he announced his retirement from Congress after the 2016 elections. The Sandpiper is a 1965 American drama film directed by Vincente Minnelli and starring Richard Burton and Elizabeth Taylor. Then Came Bronson is an American adventure/drama television series starring Michael Parks that aired on NBC. It was created by Denne Bart Petitclerc, and produced by MGM Television. Then Came Bronson began with a television film pilot that aired on NBC on March 24, 1969; the pilot was also released in Europe as a theatrical feature film. This was followed by a single season of 26 episodes airing between September 17, 1969 and April 1, 1970.